The latest California actor turned governor, Arnold Schwarzenegger, has picked a battle that he can not win. Arnold is a cartoon warrior. His opponents up to now have been mainly celluloid villains and opinion poll watching politicos. 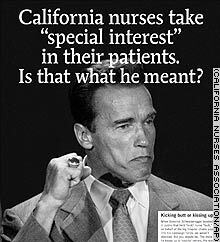 What Arnold has found out in his rash decision to issue an emergency order rolling back nursing ratios in emergency rooms is that California's top nurses are tenacious and brilliant: "Arnold behaves like an arrogant patriarch with respect to women's occupations," said Rose Ann De Moro, executive director of the California Nurses Association. "Nurses, teachers, home health workers -- it's vulgar how he's run roughshod over them. 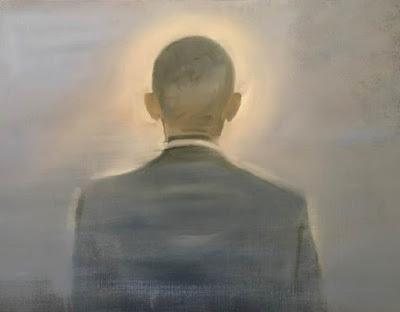 He's arrogant, and he's a bully." The AP reports how these events started "in December, when a small group of nurses gathered at a state women's conference to protest Schwarzenegger's decision to side with hospitals and limit the state's nurse-to-patient ratio. With his wife,Maria Shriver in the audience, Schwarzenegger responded to the protesters by saying, "The special interests don't like me in Sacramento because I am always kicking their butts." The nurses union denounced his comment, and the attacks on the governor have escalated since." "The arrogance of taking on teachers, nurses and other professions where women are underpaid, overworked and vital to society is beyond the pale," said Jamie Court, president of the Foundation for Taxpayer and Consumer Rights. "But Arnold is someone who treats women as objects, so it's natural for him to have a tendency to disregard and devalue professions that are made up of women." Last week, critical care nurse Kelly DiGiacomo had a ticket to attend the Sacramento premiere of Governor Schwarzenegger's new film-Be Cool: Get Shorty II. While seated in the audience, in her nurses’ uniform, DiGiacomo was approached by an undercover officer who demanded to see her ticket and pulled her out of the audience. DiGiacomo was then detained in a small back room where she was interrogated for an hour by an undercover officer while other officers guarded her. She was then held for another 30 minutes before her release. “It’s appalling that the highest constitutional officer of our state feels a nurse’s uniform is threatening, and is unwilling to allow a working nurse to attend a public event,” said CNA Executive Director Rose Ann DeMoro. 1. Maintain the 1:4 minimum ratio in the Emergency Room at all times. 2. Implement the 1:5 ratio in Medical–Surgical Departments. E-mail the governor at governor@governor.ca.gov and cc CNA at press@calnurses.org.